In Happy Horses on Facebook game you get to pick your very own horse to start off with. 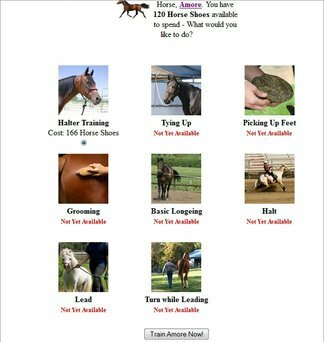 You can choose your horse’s name, gender, and breed then you then train your horse for best in show or barrel racing. Along the way however you must feed, take care of, and interact with your horse. I would describe this as a forum-type game. The graphics are just pictures, for example. Feeding, taking care of, training, and some competitions cost horseshoes. Don't worry though, for you can earn horseshoes by interacting with your horse, plus there are probably other ways to earn horseshoes. I just haven't found them yet. If you wish to get more horseshoes you can buy silver coins with facebook credits and then convert them to horseshoes or you can use the silver coins on other things. Likes: I liked the fact that they had different horse breeds to choose from and that you can interact with other horse crazy players. Dislikes: It is not clear to me what you need to do to advance plus it was hard to figure anything out. I also did not care for the competition options. It would have been nice if they had something for English riders. Have you played Happy Horses on Facebook? If so, please share your comments and tips below.